Fadoua Hanine, Arlene Chico-Lugo, and Kevis Hillocks in Mourning Sun. Photo by Joel Weber. BOTTOM LINE: More than just an “issue play,” Mourning Sun sheds light on a preventable medical condition, but does so with a level head and a full heart. As the lights come up on the land of Mourning Sun, Biftu (Arlene Chico-Lugo), a young Ethiopian girl, thrills over one of Michael Jackson’s videos, courtesy of her resourceful friend Abdi (Kevis Hillocks). But because Abdi is an “AIDS-orphan,” he is not deemed a fitting match; instead, Biftu’s mother Emaye (Antu Yacob) marries her off to Getahun (Shamsuddin Abdul-Hamid), a man more interested in his own “rights” as a husband than in Biftu’s well-being. Soon Biftu is pregnant, but even when her labor stretches on for days, Emaye refuses Biftu medical care. Because of this, Biftu not only loses her child, but is left with a obstetric fistula—an injury caused by prolonged, obstructed labor. Incontinent (and thus smelly), Biftu is abandoned by Getahun and most of her community, and, in one of the play’s most captivatingly theatrical scenes, kicked off of bus after bus on her way from Bahir Dahr to Addis Ababa, where she hopes to secure medical treatment. Once in the capital, Biftu encounters Abdi again, and the second act finds the two in New York City, where Biftu soon learns that with first-world conveniences come unexpected difficulties, but also opportunities for new kinds of knowledge and new forms of relating. In many stories about the African subcontinent, tragedy looms large in the well-intentioned but paternalistic desire to shed light on “issues.” The end result can often paint a picture where third-world African countries have all the problems, and first-world countries (like the U.S.) all the solutions. 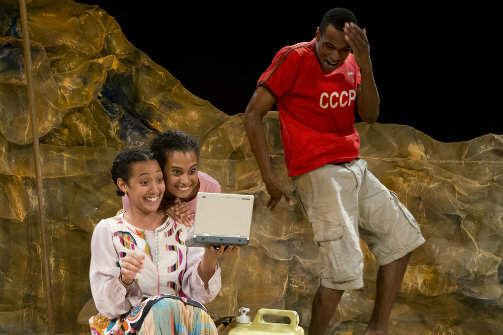 One of the best things about Yacob’s play is her ability to address a disease of poverty (fistulas are almost always preventable when medical treatment is available) without resorting to such problematic over-simplifications where the West plays the enlightened savior for tragic Africans in need of rescue. She does this partly via verisimilitude, weaving Amharic, and even a touch of Oromo, into her primarily English-language script. But more important is the way in which her characters, with the help of Ari Laura Kreith’s talented ensemble cast, are never downtrodden archetypes in need of help, but rather people who, when faced with difficult circumstances, adapt and move forward. Put another way, Yacob does an excellent job at instructing her audience without devolving into unrelenting pathos. Yet for all its level-headed eye-opening, Mourning Sun truly comes to life in the second act, when it moves from chronicling Biftu’s journey to a more character-driven meditation on connection and belonging. And in the final scenes, Mourning Sun moves from a solid play to a great one; the penultimate scene, in which the disillusioned Biftu takes refuge with Abdi’s landlord True (John P. Keller), is especially powerful—incredibly unexpected yet also somehow dramaturgically perfect, and one of the most moving portrayals of cross-cultural empathy I have seen on stage. The entire ensemble cast is quite good, especially Hillocks as Abdi, Fadoua Hanine as Biftu’s sister Mawardi and later Abdi’s “friend” Kayleen, and John P. Keller as True. And best of all is Theatre 167 regular Arlene Chico-Lugo, truly outstanding as Biftu; Chico-Lugo finds the perfect balance between strength and vulnerability that is so essential to fully realizing Yacob’s intent. Kreith’s staging, along with Jen Price Fick’s set design—painted fabric draped to resemble rock formations, combined with a few wooden archways—strategically moves us from one location to the next. And I especially enjoyed Jessa Raye Court’s spot-on costume design, which evidences why even contemporary costume design requires thought and skill. There are a few minor flaws; for example, in its speedy transition from the first act to the second, Mourning Sun glosses over the time-intensive realities of legal immigration into the United States. Yet for those in New York, a purportedly international city where so much of our theatre is resolutely provincial, Mourning Sun provides a stirring reminder of what can be gained by looking past what is familiar. Mourning Sun is written by Antu Yacob and directed by Ari Laura Kreith. It is produced by Theatre 167. Scenic Design is by Jen Price Fick. Lighting Design is by Matthew Fick. Sound Design is by Travis Wright. Costume Design is by Jessa Raye Court. Music Director is Benjamin Morss. Fight Choreographer is Erica Gould. Choreographer is David Terry. Production Stage Manager is Miriam Salzman.